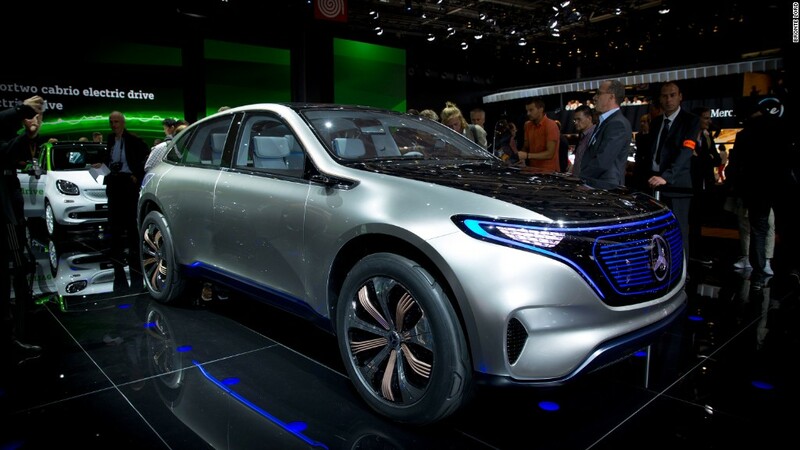 Mercedes-Benz unveiled a concept for an electric SUV at the Paris Auto Show Thursday -- the first of what will be a whole line of electric vehicles. The Generation EQ has the sloped-backed SUV body style that has become a hot trend among luxury automakers. There are several adjustments to the design, however, with barely visible body panel seams, hidden windshield wipers and cameras instead of exterior mirrors. The "grill" is a smooth lighted panel. Since it's not a real grill, it can be programmed to display different shapes and images, said Gorden Wagener, head of design for Mercedes. Inside, there are no knobs or switches: Everything is controlled through a huge touch screen that covers much of the dashboard. 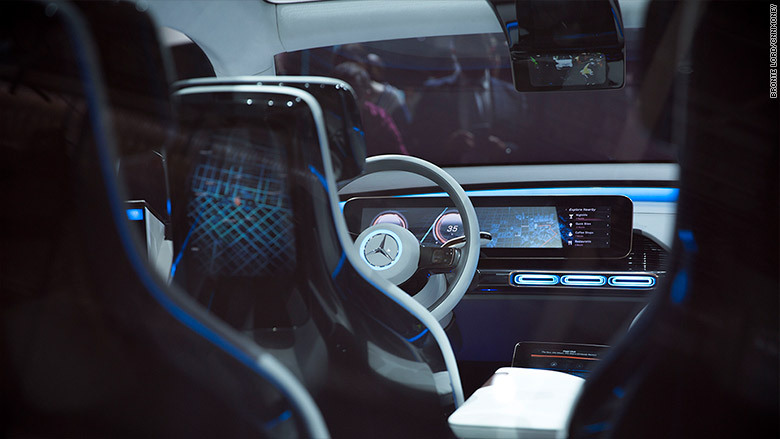 The SUV will be capable of autonomous driving "as far as you can safely and legally go," said Dieter Zetsche, chairman of Mercedes parent Daimler (DDAIF). Powerful batteries will give the SUV a driving range of over 300 miles. It will be priced like a "reasonably equipped Mercedes GLC." At today's prices, that would be around $50,000. The rest of Mercedes' electric line-up -- dubbed Mercedes-EQ -- could include SUVs, sedans and convertibles, and will share engineering. Mercedes-EQ will ultimately be available in showrooms alongside the Mercedes-AMG performance brand; the Mercedes-Maybach ultra-luxury brand; and the Mercedes-Benz luxury brand. Mercedes executives did not say when sales would begin. By 2025, Zetsche said Mercedes plans to have 10 fully electric vehicles in the market, making up 15% to 20% of its total sales worldwide. A day earlier, Volkswagen unveiled its own low-priced, long-range electric car that it says will go on sale in 2020.